I am deeply honored and thrilled to be included in the prestigious and radical Toronto Queer Film Festival 2018, held at OCOD University in Toronto. My parody of the Todd Haynes film “Carol” was included in the program Otherland, held on November 3, 2018. Krissy Mahan’s Carol is a stop-motion parody of Todd Haynes’ 2015 feature film Carol (2015). Referencing Haynes’ underground cult short film, Superstar: The Karen Carpenter Story (1988), this playful short, starring Fisher-Price toy figures, presents a hilarious and necessary counter perspective to Hayne’s adaption of the queer classic/classist narrative. Queer and Trans sexualities and genders existed in the Americas long before Europeans arrived and fucked everything up. 2 Spirit/Indigiqueer people have been persecuted ever since, not only by colonizers, but also by their/our own colonized communities. Upending mere reconciliation into decolonization in the Queer community means re-centering 2 Spirit/Indigiqueer people. TQFF’s theme this year is Decolonizing Sexualities. What does a decolonized sexuality look and feel like? What are alternative futures for Queer and Indigiqueer people freed from Christian-influenced censorship and shame? If a Queer festival doesn’t have power to give the land back, how can we give our spaces to Indigenous people? 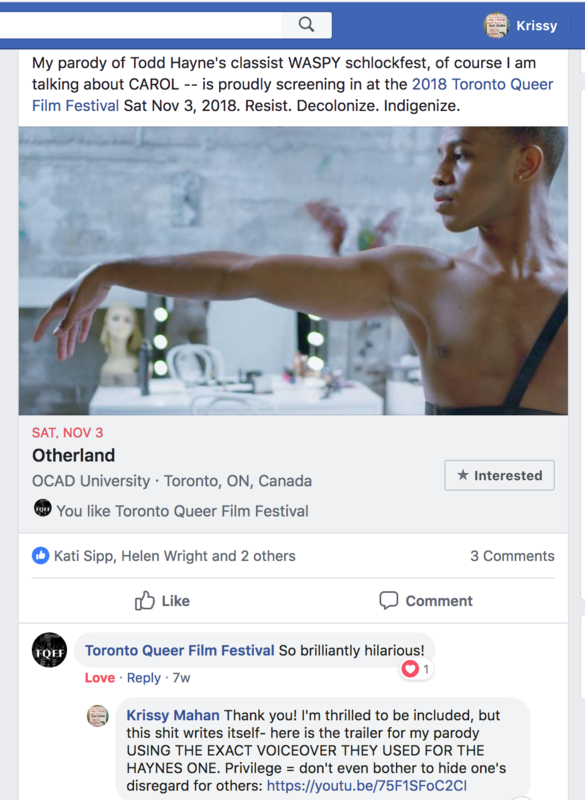 Exploring these questions and more, the 2018 Toronto Queer FIlm Festival features twelve screenings plus workshops and panels from November 1-4 at OCAD University. In recognition of our festival theme Decolonizing Sexualities, over 45% of the films selected were made by Indigenous directors, with another 40% produced by directors of colour. Undone explores the troubled language of the tactile body. A portrait of Kenta Kambara from Japan, who made headlines in Rio at the 2016 Paralympic Handover Ceremony for his acrobatic dancing with a wheelchair. Mariana, Jodie-Ann, and Diane are three queer as f*** women of color who discuss their past, present, and future without any filters or taboos. way home is an atmospheric visual and auditory landscape through which the artist shares deeply resonant poetry woven from love, pain and longing at the intersection. As we travel with the artist, we are brought on a revealing journey with tender memories of play, grief, abandonment, resilience and various other dissonant emotions the concept of home can invoke for Black folks in the diaspora. Filmmaker Tiffany Rossi asks: Have you ever felt detached? A young woman becomes emotionally detached in her relationship as she struggles with depression and fear of intimacy. This long-awaited short film imagines iconic transgender artist and activist, Marsha ‘Pay it No Mind’ Johnson, in the hours before the Stonewall Riots in New York City when drag queens and trans women fought back against enduring police brutality. Starring Independent Spirit Award Winner, Mya Taylor. Dancer Elvin Elejandro Martinez performs at a Voodoo Carnival Ball, an important dance contest where he will have to prove himself to be accepted by the local ballroom community. He remembers growing up on Sint Maarten, a small island in the Caribbean, and all the changes he has been through since migrating to the Netherlands. This entry was posted in Arts/Politics, Events, Film festivals, Random Stuff, Videos on October 28, 2018 by krissy.